Six monkey tribes vie for supremacy while you decide which ones to launch back home to Earth. These tribes do not get along, and you must decide which ones to befriend while enduring the scorn of the others. Will you be anointed the Supreme Leader of these primates? 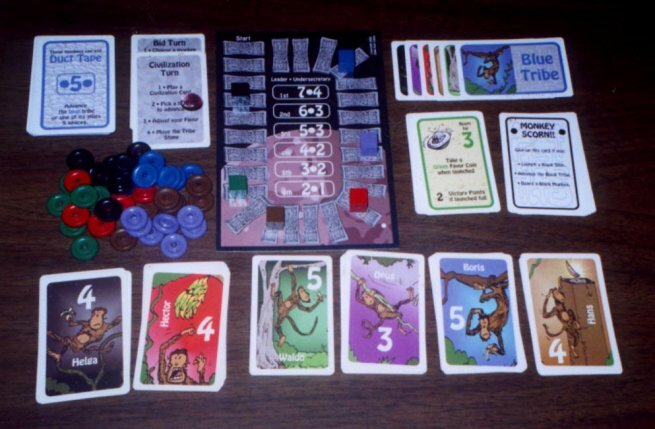 Monkeys on the Moon is a full-color game that includes 110 cards, 48 wooden pieces, a game board and a rules sheet. The original artwork was done by Scott Starkey. It's a difficult task to break into the game industry. Many designers try for years to sell their games to publishers. Others spend a small fortune self-publishing their game, only to end up with a couple thousand copies in their basement for years to come. I'm always interested in a success story, and that is what Jim Doherty has been able to tell the last couple years. His company, Eight Foot Llama, got the spotlight when his first game showed up in Games Magazine's Games 100. I still remember the buzz online, "What's this game? Has anyone heard of Who Stole Ed's Pants?" More than a few curious customers purchased the game and Jim was forced to step up from his self-published version to a mass-produced second edition. A year later, Eight Foot Llama has released a second game and it also found its way into the year's Games 100. From small, self-published printings to honored success with his new company, it seems like whatever Jim's doing with game design, he's doing it right. I wrote Jim in early October and asked if he'd grant us an interview. Just after returning from his first visit to the game fair in Essen, Germany, he heartily agreed. I took the opportunity to ask him a few questions about game design and, more specifically, his latest award winner, Monkeys on the Moon. Mike Petty: When you're not designing games, Jim, what do you do for a living? Jim Doherty: I'm working full-time on Eight Foot Llama right now. In my previous life I was an electrical engineer. MP: And how did you get started designing games? JD: I've always designed games, but I started doing so professionally when Who Stole Ed's Pants was ranked highly on the Games 100 list for 2002. At that point, I could not keep up with the orders by making the game at home, and I decided to mass-print the game. MP: Speaking of ranking in the top 100, congratulations on Monkeys On The Moon! That's two for two. MP: In case anyone's interested, what's the process for getting Games Magazine to consider your games? . JD: You can reach them at The Editor, GAMES, PO Box 184, Fort Washington, PA, 19034. Just include a game, your contact info and a request that you'd like to be considered for a review. MP: You recently returned from the game fair in Essen, Germany. How was the trip? JD: Essen was fantastic. I've never seen so many people having a good time simultaneously in my life. It really has to be experienced to be believed. MP: And how was your latest game received there? MP: Many have noted that the mechanics in your games have a very "German", yet your subject matter is quite non-conventional for those types of games. Where do you get your ideas for new designs? JD: I don't think there's a general answer. For Who Stole Ed's Pants, it was just a realization that framing others for a crime could be fun, and that it hadn't been done before. Monkeys on the Moon, believe it or not, was born out of the fact that I really liked the title. MP: Could you give us a brief overview of the design process for Monkeys on the Moon? JD: Well, based on the title, I knew there were monkeys on the moon, so it was a matter of figuring out what they might be doing up there. I figured they were squabbling amongst each other, trying to improve their lives, and really wanting to come home. So the idea was to reward the player who managed to befriend the most powerful tribes and get them back to Earth. My design model was something like trying to get elected president of the UN. You try to help out everybody, but you can't since everyone has conflicting needs and existing rivalries. And you only have limited resources to use, so you have to decide where they would be best spent. Therefore a bidding mechanic using the idea of "tribal favor" made the most sense. MP: How long did it take you to finish the game? JD: Monkeys was about 6 months. That includes the time to lay out the whole thing in publishing software. MP: When do you know one of your games is finally finished and ready for publication? JD: Usually when I end a playtest session, I walk away with several nagging thoughts that some things aren't right. Sometimes the solution is simple, and sometimes it requires a near total re-design. But over time, the problems begin to disappear and eventually the playtest sessions seem more like playing and less like testing. If everyone enjoys the game and looks forward to playing again, and I'm not lying in bed that night thinking about how to fix some problem, then I know I'm just about there. MP: How do you round up playtesters for your designs? JD: 90% of the playtesting is done by experienced gamers that I know very well. They're all very picky and don't hold back criticism (like myself). I've also met some folks online that have been very helpful. Once we're all satisfied, I take prototypes to small cons and get further feedback from people I've never met. MP: What's been your favorite aspect of working in the game industry? JD: The helpfulness of almost everyone in it. If I had started, say, my own restaurant, I don't think that established restaurant owners would be going out of their way to help me the way game companies have. It's really been amazing. MP: Related to that, I seem to remember something about you publishing Who Stole Ed's Pants shortly after attending James Kyle's workshop at GenCon about self-publishing. Is it true that the seminar helped you to pursue publication of that game? JD: Yes, it certainly is true. James is perhaps Earth's most helpful human. It was at his GenCon seminar that I learned one could make very good-looking games at home and that he had found success doing so. At the time, Who Stole Ed's Pants was half finished and I wasn't sure what, if anything, I would do with it. But the seminar inspired me to complete the game and develop a high-quality first edition. MP: What's the best advice you could offer someone trying to get their own designs published? JD: I'll assume you're talking about self-publishing as opposed to getting an existing company to buy your first game, because the latter happens rarely. I would say, invest in quality prototyping equipment (a good printer, a laminator, etc) so that you can make the game at home to start out. This way, you don't have to spend a bundle to make thousands of games, and you can make changes as required to improve the game. If you take it to cons and more than half the people who play it demand to buy a copy, you might have something. Send it off to reviewers, and if they like it as well, you might investigate mass-printing. But be well aware that this is a very tough industry to profit in. And don't invest more than you can safely afford to lose. MP: What things can we expect from Eight Foot Llama in the future? JD: I think for the time being we'll be sticking with board games about the size and price of Who Stole Ed's Pants and Monkeys on the Moon. I'd like to do something larger someday, but I don't think we're quite ready for it yet. It could be interesting to work with other designers in some capacity as well. James Kyle and I have kicked around a few ideas and it'd be great to do something with him sometime. We'll see what opportunities arise. MP: And we'll definitely look forward to them. Thank you for the interview.